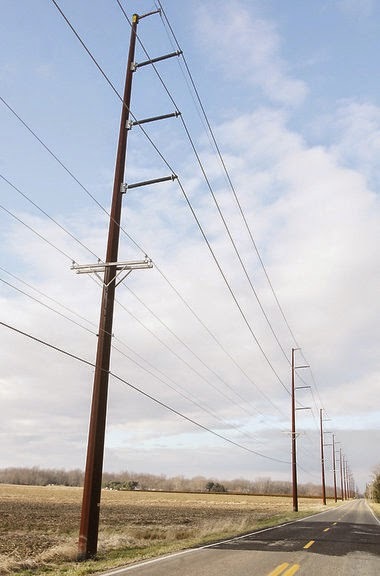 Atlantic City Electric (ACE) has begun preparations by way of tree-trimming in order to install new steel poles as electric poles through certain areas in Galloway Township. Atlantic City Electric representatives appeared before Galloway Council on Tuesday, September 9, 2014 and provided information including the area the new poles will be installed. The current lines which consist of 69,000 volts will not change according to the ACE representative. Representatives stated the steel poles proposed to be installed are part of the companies rebuilding effort in order to stabilize electricity with the increase of outages. The poles are estimated to be over 50-years old. "In the last few years Galloway Township has had a tremendous loss of electricity supply with some of the storms that we have had, hoping that this will help some of the areas in the town is very promising" Mayor Don Purdy stated. On August 22, 2014, Atlantic City Electric sent a letter to an undisclosed list of customers along the service area that the new poles will be installed. The letter however, did not mention anything regarding new poles. The letter in full as released by Atlantic City Electric reads as follows; "Please be advised that Atlantic City Electric Company will be doing maintenance tree trimming on our existing Right of Way which is adjacent to or through your property. This maintenance work will begin in September." The letter also stated, "in conjunction with this project, the tree trimming being done is “Wall Trimming” which I have included a picture of with this letter. All maintenance work will be done under previously secured rights." The letter ends with, "all employees of the firms involved with the maintenance work will be operating plainly marked vehicles and have company agency identification cards." During the Council Meeting the Atlantic City Electric representative notified Council for the first time that new steel poles will be erected. Some poles will be 70-75 feet tall, approximately 15-17 feet taller than the current poles and will be steel. There will be approximately 148 steel poles being installed where the larger poles will most likely be installed at the corners of the road and will be approximately 4-5 feet in diameter with a 4-foot foundation. The area of installation for the new poles is along a residential area (Fourth Avenue) and along the roadway for public schools (Jimmie Leeds and Wrangleboro Roads) in Galloway Township. See Map as provided by Atlantic City Electric. The route of the tree-trimming in preparation of the installation of the poles will start at the White Horse Pike (USRoute 30) and 4th Avenue and will head North on 4th Avenue then turn West on Upland Avenue. From Upland Avenue they then turn North on 2nd Avenue to Jimmie Leeds Road where the route will head West. Heading West on Jimmie Leeds until the poles head North on Wrangelboro Road until they reach the new substation already built on Moss Mill Road. Frank Tedesco, Media Relations Manager for Atlantic City Electric stated, "based off of comments received from residents and Galloway officials, Atlantic City Electric will continue to analyze the design and location for some of the poles that will be installed. Generally, all of the new poles will be installed in close proximity to the existing poles." The project is scheduled to begin in October 2014 and is slated to be completed around early spring in 2015. Phase 1 of the project is the installation in Galloway Township and Phase 2 is Galloway Township to the Tuckerton area in Ocean County. Safety concerns were raised at the Council Meeting by Mayor Don Purdy. Atlantic City Electric could not provide any information regarding the safety of steel poles when it comes to motor vehicle accidents and collisions. The representative could not provide any safety data or testing for motor vehicle accidents. "I believe that is necessary to upgrade the electrical transmission in Galloway Township but I disagree that they were not telling the public of the process that they were going to install different polls" Mayor Don Purdy stated Sunday night. "I have had talks with the electric company and I believe they understand our concerns regarding the large oversize poles that were going to be at multiple intersections. They are working on a compromise to decrease the size of the polls and possibly the guide wires across the street to another pole to help the aesthetics of the pole" Purdy further stated. Purdy stressed it was very important that Atlantic City Electric work with the Township and the County to make sure that the right-of-way the polls are in are not obstructing any site triangles for safety of the motorist. Purdy stated he continues to have phone calls with Charlie Winburg from Atlantic City Electric regarding the concerns and that he is working through the Township Manager to make sure that these concerns are being addressed. Atlantic City Electric stated they would notify the residents in the area of the new poles soon. No date was provided at time of publication. Why is it necessary to run this line through a residential neighborhood? What's wrong with using the Parkway as a right of way?